Note: Information on this page is highly dynamic. We appreciate our readers letting us know when we have made a mistake on an event date or time to help us keep this information as accurate as possible. Scroll down this page for the schedule for government meetings and regular monthly repeating meetings. Do a Shift or CTRL/Refresh (keyboard/mouse click together) to make sure you are seeing the most current version of this page. Printing Tip: If you want save paper and print the events for only a certain month, use your mouse to select the text you want from this web page, then COPY/PASTE into your word processor and print as a text file. 6PM, Big Piney Library. Celebrate with an informal meet and greet hour with appetizers and history slide show. The GRVC is a non-profit organization of dedicated local women whose objective is to develop educational awareness of beef and to promote a better understanding of the various roles the beef industry plays in the environment and the economy. At 6:00PM on Thursday in the Boardroom of the Pinedale Library. They will have election of officers and precinct chairs. Any registered Democrat may run for an officer position. For ages toddler to 5th grade. Starts at 10AM at Boyd Skinner Park in Pinedale. Don't be late - it happens fast! Bring your camera, a special guest may be there! Starting at 1:00PM at the Sublette County Fairgrounds. This is a free event hosted by the Summit Church in Marbleton. There will be hunts for various age groups, from toddler through teen. Summit Church will also provide a free hotdog lunch. To discuss potential renovations to exisdting wetlands at the Soda Lake Wildlife Habitat Management Area five miles north of Pinedale. The meeting is on Wednesday from 6-8PM at the Game & Fish office in Pinedale. Saturday at the Sublette County Fairgrounds north of Marbleton. Starts at 3:30PM. This is a fundraiser for the arts in Sublette County. VIP Table $500, Sponsor Table $300, Stud Fee Sponsor Table $150. Donate online at www.pinedalefinearts.com or mail a check to PFAC, PO Box 1586, Pinedale, WY 82941. Co-sponsored this year by the Pinedale Lions Club and Main Street Pinedale. Saturday, beginning at 8AM. Choose a route and pick up bags at Rendezvous Pointe. Free lunch for participants from noon to 1PM. At the Sublette County Fairgrounds in Big Piney. Casino Night fundraiser. Doors open at 4PM. Tickets $65/person, gets $20 in casino chips, membership, and dinner. Dinner is smoked beef brisket or chicken, by Pitchfork Fondue. For more information call Ray 307-203-7250 or Amy 307-203-6024. More info TBA. At the Sublette County Fairgrounds in Big Piney. Friday & Saturday from 9AM to 5PM. Sunday from 9AM to 4PM. Exhibits, field trips, raffles, door prizes, fluorescent mineral display, kids' activities. Food concession on-site. Demonstrations on knapping, wire wrapping, faceting, gold panning. There will be rough rock, slabs, beads, jewelry, cabochons, jade, supplies, opal, fossils. The Grand Prize for the raffle is a new mineral rock discovery from Brazil. Admission is $2.00 for adults. 1 - April 27: Synthesis - Art Show by Pamela Gibson At Mystery Print Gallery in Pinedale 221 S Sublette Ave. The Artist Reception will be on Thursday, March 7th from 5-8PM. Call 307-749-3473 for more info. 17: Wyoming Food Bank of the Rockies Mobile Pantry will be in Marbleton/Big Piney Free food to community members. No eligibility requirements, membership fee or restrictions. At the Southwest Sublette County Pioneers Senior Center in Marbleton from 3:30-4-5:30PM. Made possible by a generous donation from Jonah Energy LLC. 17: 50th Anniversary of the Green River Valley Cowbelles / Cattlewomen 6PM, Big Piney Library. Celebrate with an informal meet and greet hour with appetizers and history slide show. The GRVC is a non-profit organization of dedicated local women whose objective is to develop educational awareness of beef and to promote a better understanding of the various roles the beef industry plays in the environment and the economy. 18: Wellness Screening in Pinedale From 7AM to 10AM in the conference room of the Wyoming Game & Fish Department Office, 432 E Mill Street. This event is open to the public. Eligible State of Wyoming Health Plan Participants get a free blood chemistry panel and flu vaccine. There is a cost for others depending on the test you request. For questions, please call Wyoming Health Fairs at 800-979-3711 or the Game and Fish Office at 307-367-4352. Click here for more info. 18: Sublette County Historic Preservation Board (CLG) regular meeting in Marbleton Sublette County Certified Local Government (CLG) Board. This meeting was changed from the normal meeting date of April 23rd. 3:00PM in the Southwest Sublette County Pioneers Senior Center. Discussions today will be about the 2019-2020 budget. Public welcome to attend. 18: Underwater Easter Egg Hunt at the PAC 5:30PM at the Pinedale Aquatic Center. More info at www.pinedaleaquatic.com. 18: Sublette County Democrats Special Meeting At 6:00PM on Thursday in the Boardroom of the Sublette County Library in Pinedale. They will elect people to serve in two county leadership positions that were not filled during the March reorganizational meeting: Secretary and State Committeeman. They will also elect Precinct Chairs for positions that were not filled in November: Precinct committeemen and women who make up the voting members of Sublette County's central committee will vote for their county's Secretary, State Committeeman, and Precinct Chairs. Any registered Democrat may run for an officer position. 20: Pinedale Lions Club Easter Egg Hunt For ages toddler to 5th grade. Starts at 10AM at Boyd Skinner Park in Pinedale. Don't be late - it happens fast! Bring your camera, a special guest may be there! 20: Community Easter Egg Hunt and Lunch Starting at 1:00PM at the Sublette County Fairgrounds. This is a free event hosted by the Summit Church in Marbleton. There will be hunts for various age groups, from toddler through teen. Summit Church will also provide a free hotdog lunch. 22: Pinedale Town Council interviews of applicants for the vacant Pinedale Town Council seat Applications must be into Town Hall by 4:00PM on Monday, April 15th. Turn in to Town Hall, 69 Pinedale South Road. Must be a resident of the Town of Pinedale. 24: Wyoming Game & Fish Soda Lake Renovation Public Meeting in Pinedale To discuss potential renovations to exisdting wetlands at the Soda Lake Wildlife Habitat Management Area five miles north of Pinedale. The meeting is on Wednesday from 6-8PM at the Game & Fish office in Pinedale. 25: SAFV Annual Spring Luncheon 11:45 - 1PM in the Lovatt Room of the Pinedale Library. Guest speakers talking about the history of violence against women movement in the United States. Talk: "The History of the Violence Against Women Movement: Past, Present & Future. Special Guest speaker is Tiffany Eskelson-Maestras, Advocacy & Resource Director for the Wyoming Coalition Against Domestic Violence and Sexual Assault. No cost for lunch, catered by Moose Creek Catering. Seating is limited. Please RSVP to SAFV by April 22nd, 307-367-6305 or 307-276-3975. 25: Sublette County Museum Board meeting in Big PineyContinuation of budget discussions for 2019-2020FY County money for the Green River Valley Museum and Museum of the Mountain Man. 1:00PM at the Green River Valley Museum in Big Piney. Public welcome to attend. 27: Geared Up Bike Shop Open House & Bike Raffle Drawing 432 W Pine Street, Pinedale Wyoming from Noon to 3:00PM. Food & spirits. Drawing for a Marlin 5. All ticket sales go towards medical expenses for Sublette County resident Jen Taylor. 1: Pinedale Aquatic Center annual Summer Expo Wednesday from 3:30 to 6:00PM. Come find out more about area organizations and the actiities they offer in the community for youth and family. There will be many vendor tables with information. Free food, raffle prizes and more. Vendors can have table space at no charge. Call the PAC at 307-367-2832 or go online to www.pinedaleaquatic.com for more information. 2: Rural Health Care Q & A in Marbleton The Sublette County Rural Health Care District invites the public to join Dave Doorn, Administrative Director, and members of the Board, to discuss the future of health care in Sublette County. The session will be held on Thursday at 12:45PM at the Southwest Sublette County Pioneers Senior Center in Marbleton. Another session will be held in Pinedale in June. 4: Passport Fair in Pinedale From 11AM to 2PM at the Pinedale Library. Cash or checks only. Documents needed: Original or certified birth certificate with raised seal. Photo ID. Youth under age 16, both parents or notarized DS 3053. Forms available at the Pinedale Post Office or online at travel.state.gov. For more info call Big Piney Post Office at 307-276-3772. 4: Last day to get tickets for Muley Fanatic Foundation Fundraiser The event will be held on Saturday, May 18th. Tickets are $65/person. Kids 11 and under free with paid adult ticket.Saturday at the Sublette County Fairgrounds. For more information call Ray 307-203-7250 or Amy 307-203-6024. 4: PFAC Kentucky Derby Party & Annual Fundraiser Saturday at the Sublette County Fairgrounds north of Marbleton. Starts at 3:30PM. This is a fundraiser for the arts in Sublette County. VIP Table $500, Sponsor Table $300, Stud Fee Sponsor Table $150. Donate online at www.pinedalefinearts.com or mail a check to PFAC, PO Box 1586, Pinedale, WY 82941. 7: Town of Pinedale Special Meeting At 4:00PM in the Lovatt Room of the Sublette County Library. Agenda items are the award of the contract to construct the dump and fill station and the interview of candidates to fill the town council vacancy. An appointment may be made to fill the vacant council seat. The interviews to fill the council vacancy previously scheduled for April 22, 2019 at 4 PM have been re-scheduled and will take place at this Special Meeting. 8: Pride Not Prejudice in Pinedale - 3rd Annual LGBTQ Pride Picnic From 11AM to 2PM at the American Legion Park in Pinedale. Everyone welcome. There will be speakers, music, potluck, games. Hosted by the Women's Advocacy Group. 18: Pinedale Community Clean-Up Day Co-sponsored this year by the Pinedale Lions Club and Main Street Pinedale. Saturday, beginning at 8AM. Choose a route and pick up bags at Rendezvous Pointe. Free lunch for participants from noon to 1PM. 18: Mulie Fanatic Foundation 5th Annual Banquet and Fundraiser At the Sublette County Fairgrounds in Big Piney. Casino Night fundraiser. Doors open at 4PM. Limited tickets available - tickets $65/person, gets meal, MFF membership and $20 in casino chips. Tickets available until May 4th. Dinner is smoked beef brisket or chicken, by Pitchfork Fondue. For more information call Ray 307-203-7250 or Amy 307-203-6024. Wildflowers begin to bloom, springtime in the valleys. All but highest trailheads accessible by end of the month. High country trails typically have snow until end of the month. Campgrounds start to open, water tests. Usually safe to plant flowers outside after Father's Day. 1: Sommers Homestead Living History Museum opens for summer season Open June, July & August on Fridays and Saturdays from 10AM to 3PM. Admission by donation. Hands-on living history museum operated by the Sublette County Historical Society. Tours on other days can be done by special arrangement. Call the Museum of the Mountain Man, 307-367-4101 for more information. 4: Rural Health Care Q & A in Pinedale The Sublette County Rural Health Care District invites the public to join Dave Doorn, Administrative Director, and members of the Board, to discuss the future of health care in Sublette County. The session will be held on Tuesday at 10:00AM at Rendezvous Pointe in Pinedale. 4: Youth Track Meet at the PAC Check in begins at 4PM. Events begin at 4:30PM. Register online at www.pinedaleaquatic.com. 14-16: Sublette County Rock Hounds Club 3rd Annual Gem & Mineral Show At the Sublette County Fairgrounds in Big Piney. Friday & Saturday from 9AM to 5PM. Sunday from 9AM to 4PM. Exhibits, field trips, raffles, door prizes, fluorescent mineral display, kids' activities. Food concession on-site. Demonstrations on knapping, wire wrapping, faceting, gold panning. There will be rough rock, slabs, beads, jewelry, cabochons, jade, supplies, opal, fossils. The Grand Prize for the raffle is a new mineral rock discovery from Brazil. Admission is $2.00 for adults. 22: Big Piney/Marbleton Airport AnnuLiial Fly-In/Car Show & Pancake Breakfast Starts at 8AM. 20: 3 on 3 Basketball Tournament in Big Piney At the Big Piney Recreation Center. Hosted by the Big Piney Booster Club. 10: Sprint Triathlon in Big Piney At Big Piney High School. Hosted by Friends of Big Piney Recreation. 1: Sommers Homestead Living History Museum Open House & honoring the 2018 Sublette County inductees into the Wyoming Cowboy Hall of Fame Open House from 10AM to 3PM. Free lunch of roast beef, potatoes, beans, salad, delicious homemade desserts. Lunch starts at 11:30AM (don't be late). Wyoming Cowboy Hall of Fame program starts at 1PM. Call the Sublette County Historical Society for more info (Museum of the Mountain Man 307-367-4101). 3: End of Daylight Savings Time "Spring Forward - Fall Back" Set your clocks BACK one hour today. Please support our sponsors. They help make this page possible for your free viewing. Town of Pinedale Planning & Zoning Board meets the 1st Monday of every month at 7 pm, 210 West Pine Street (when they have agenda items). Check with the Pinedale Town Hall to verify specific meeting dates, www.townofpinedale.us. Marbleton Town Council meets the 2nd Monday of each month, 7 pm, Marbleton Town Hall. Pinedale Travel & Tourism Commission meets the 3rd Wednesday of every month at noon. Meetings are open to the public. Contact: info@visitpinedale.org, 307-749-1533 for more info on agenda and meeting location that month. Aniel Daniel Chili Cook-off (Daniel) - Last Sunday in March or first Sunday in April. Held at the historic Daniel Schoolhouse. Social gathering and great chili competition. Bondurant BBQ (Bondurant) - Always held the last Sunday in June following church services at St. Hubert the Hunter church in Bondurant. Fundraiser for the community. Chuckwagon Days (Big Piney) - Always held the 4th of July weekend in Big Piney and at the rodeo grounds at the Sublette County Fairgrounds north of Marbleton. Includes parade, community picnic/BBQ, Little Buckaroo Rodeo, adult rodeo and fireworks. Jensen Angus Bull Sale Always the 2nd Saturday in February at the Sublette County Fairgrounds. For more information call Justin Jensen 307-360-6293 or Renee 307-360-9136. Pinedale 4th of July Town Picnic & Fireworks - July 4th. Community picnic with great food and chance to get with your neighbors and the Town to socialize. Old Timers' Picnic (Daniel) - Held the 2nd or 3rd Sunday in July. Held at the historic Daniel Schoolhouse. Great food and socialization. Sailing Regatta on Fremont Lake - Always the 2nd full weekend in August. Based from Lakeside Lodge and hosted by the Pinedale Boat Club. Museum of the Mountain Man Wreath & Chocolate Auction - Always held the first Friday in December in Pinedale. Daniel Community Christmas Party - The Sunday before Christmas in December. Every Monday: Veteran family support group From 4-6 PM at the Veteran Services Center in Pinedale adjacent to the medical clinic. Contact Linda Romasko for more information, 719-213-0764, elromasko@gmail.com. Every Monday and Tuesday: Pinedale Drivers Licenses, 1551 W. Pine Street (in the west end of the Wyoming Department of Transportation Highway Department building on US 191 on the west side of Pinedale). Every Monday and Wednesday: GED at the Big Piney Annex, 650 Piney Drive from 5-8PM. 1st Monday: Mountain Man Back Country Horsemen Meet the first Monday of every month at the Public Health office in Pinedale at 6pm. Contact Jim Gehlhausen 307-859-8674 for information. 1st Monday: Town of Pinedale Planning and Zoning Commission meetings Pinedale Town Hall. 2nd Monday of every month (Sept – May): Pinedale Wrangler Booster Club meetings at 5:30 PM in the Pinedale High School Media Room. Every Tuesday: Immunization Clinics weekly at Public Health in Big Piney 1 - 4 p.m. Call 307-367-2157 or 307-276-3575 for more information. Every Tuesday: Support group for survivors of tragic loss and suicide Meets at St. Andrews Episcopal Church on the Pines in Pinedale at 5:15PM. For more information contact Jackie Downie, LCSW 307-231-4625. Every Tuesday & Wednesday: Archery League 6-9 pm at the Sublette County Ice Arena in Pinedale. 2nd Tuesday: Pinedale Boat Club At 6:00PM at the Pinedale VFW. Every Tuesday: Bible Study at the Daniel Community Center, 18 Schoolhouse Lane in Daniel, 6 pm. 2nd Tuesday: Trout Unlimited Upper Green River Chapter Meets at 7:00PM in the Pinedale Library Board Room. 2nd Tuesday: American Legion Post 47 monthly meetings in Pinedale. 7:30pm at the Pinedale VFW. Contact Sue Shenefelt for more information, adjpost47@yahoo.com or 307-360-8460. 3rd Tuesday: Sage and Snow Garden Club Meets the third Tuesday every month, except July and August, starting at 5PM at the Sublette County Extension Office in Pinedale. Anyone is welcome to attend. For more information, please contact the Sage and Snow Garden Club at sageandsnow@yahoo.com or Box 2280, Pinedale, WY 82941. 3rd Tuesday: Big Piney/Marbleton Volunteer Fire Department Joint Powers Board meetings. Marbleton Fire Hall, 7:00 pm. Every Wednesday: Driver's Licenses in Big Piney, 650 Piney Drive, 10-noon, 1-4 pm. Every Wednesday: Christian Classic Live Reading Join Pastor Larry Lowen of Wind River Baptist Church for an hour of reading from Christian literature. During the noon hour in the American History eritage Room of the Pinedale Library. For more information call Mo 307-367-2414. 1st Wednesday of each month: Pregnancy Resource Center’s Moms Group meets the first Wednesday of each month from 10:30AM – 12 noon at BOCES. For more information, call the PRC at 307-367-7077. Every Thursday: Immunization Clinics weekly at Public Health in Pinedale 1 - 4 p.m. Call 307-367-2157 or 307-276-3575 for more information. Call 307-367-2157 or 307-276-3575 for more information. Every Thursday: Veterans Support & Educational Group From 4:00—5:30pm at the Sublette County Public Health Dept. in Pinedale. Enjoy fellowship with fellow veterans, good company, and a cup of coffee. Information available about coping with PTSD, trauma, anxiety, and stress management. Facilitated by Mary Sim-Barcelos, MS, LPC, who works as a mental health therapist at High Country Behavioral Health. You are not alone! Every Thursday: Co-Dependents Anonymous, a fellowship of men and women whose common purpose is to develop healthy relationships, meets Thursdays from 5:00 p.m. until 6:00 p.m. at the Pinedale Community Church, 113 South Maybell in Pinedale (right next door to the skate park). For more information please call (208) 220-6965. Every Thursday: Weight Watchers 6:00 pm, Sublette Center, 333 N Bridger in Pinedale. Call Ann Stowe for more info 360-8469. Every Thursday: Suicide support meetings NAMI/support meeting in Marbleton at the Marbleton Town Hall, every Thursday beginning November 5th at 7:00PM. This will/can be a discussion for those who are interested in a suicide survivors and family support group. Given in an open group fashion. NAMI is National Alliance for Mental Illness. For questions call Scott Dimit, 307-260-3067. 1st Thursday of each month: Daniel Comunity Center group usually meets, Daniel Schoolhouse, 6:30 pm. 3rd Thursday of each month: Food distribution at the Pinedale Food Basket. Eligibility is based on free/reduced school lunch program. (You must be registered ahead of the third Thursday to receive food. 307 231 2316.) Volunteers always needed. Food Basket hours: Mon, Tues, Thurs, Friday from 10AM-4PM, Saturday from noon to 4PM, Closed Wednesdays & Sundays. Located at 104 Bridger Avenue in Pinedale. 3rd Thursday of each month: Regular meeting of the Sublette County Conservation District board. 6PM in the USDA/NRCS Conference room, 1625 West Pine Street in Pinedale. Every Friday: Friday Fun Nights at Rendezvous Pointe Senior Center, Pinedale. Variety of games to play. Snacks and drinks available. Call 307-367-2881 for more information. Sublette County & *LaBarge area events only (LaBarge is just over the county line south of Sublette County, and their kids come to school in Big Piney, so we've adopted them too!) Please call or e-mail us with your community event information to post on Pinedale Online and/or BigPiney.com websites. **Condition for hotlinks to websites is a hotlink back to Pinedale Online-keep the traffic moving between our area websites. To submit events, contact Pinedale Online at 307-360-7689 or 307-367-6763 (Office Outlet in Pinedale) or fax to 307-367-2864 (Office Outlet in Pinedale). E-mail us at support@pinedaleonline.com, or stop by our office located in Office Outlet in Pinedale, 43 S. Sublette Avenue. Information may also be dropped off at the Big Piney Office Outlet store. Organizations and event organizers, please let us know if you find incorrect date or time information on our site about your organization so we can correct it. Copyright 2019, all rights reserved. Other websites are welcome to link to this page for Pinedale area event information. If you wish to copy information directly from this page to paste into your website, please credit Pinedale Online and link to http://www.PinedaleOnline.com, as your source. Other community calendars are available in the Sublette Examiner newspaper and the Sublette County Chamber of Commerce quarterly newsletter and e-newsletter to Chamber members. 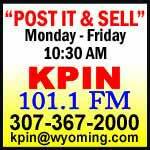 Community calendar information is also broadcast on KPIN Radio, 101.1FM in Pinedale.